It’s time that someone disrupted the pet industry and hareled it into the digital age. That’s why we’ve created MobiVet: the mobile app for pet owners and care providers that provides routine and urgent care through Telemedicine, Mobile Veterinary Services, and Emergency transport. Manage the care of your pet when and where you need based on the level of care they need. Available for both Android and IOS, on your preferred mobile app or tablet. Currently, there are products and services that provide mobile veterinary care, emergency care, and Telemedicine. However there is not an integrated solution that incorporates all three. Telemedicine is transforming processes within healthcare and has only barely been explored within the realm of veterinary care. We see this as a unique opportunity to combine all three for the greater good: solving common pain-points for both pet owners and care providers. 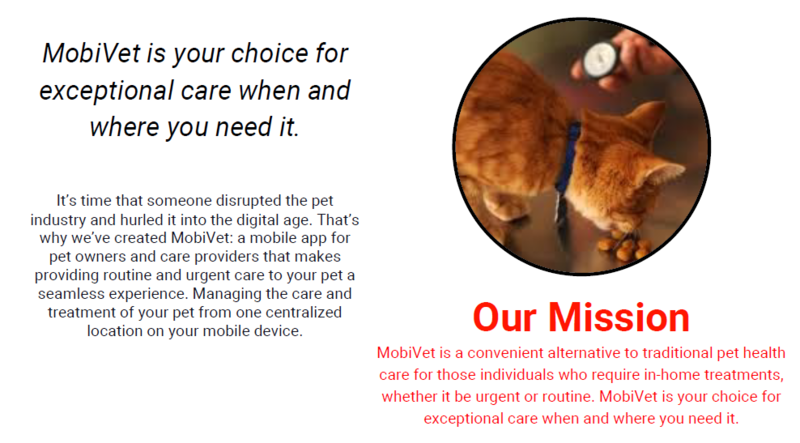 Our proposal: MobiVet, a mobile and tablet app for Android/IOS that helps pet owners and veterinarians manage routine and urgent care for pets in one place through the use of telemedicine, mobile veterinary, and emergency transport services. Pet Owners: Customers who use the platform to find pet care providers and utilize pet services in their area. 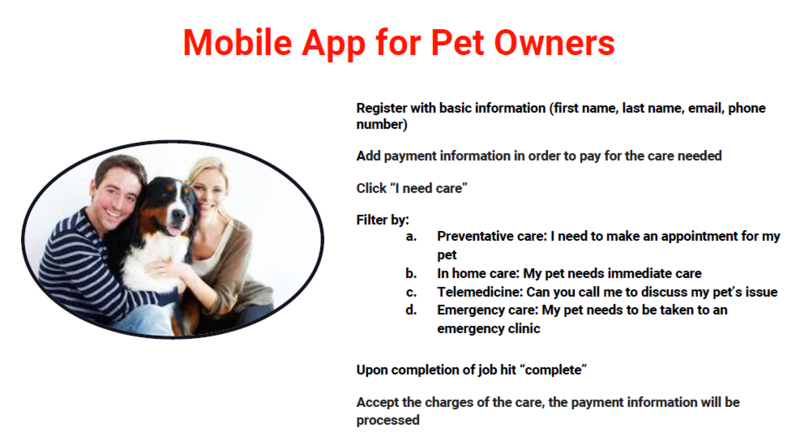 Pet Care Providers: Customers who provide pet care services in the area, who advertise their services using MobiVet. 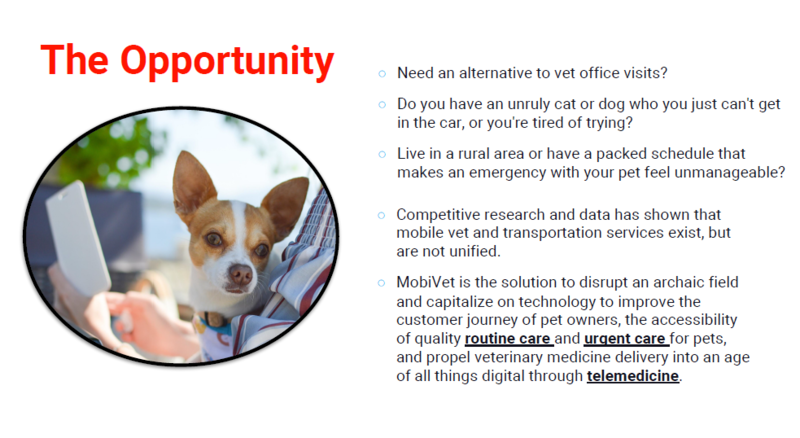 MobiVet Company: The MobiVet app is bringing customers to the pet care providers they need, and cares deeply about the success of this project as well as the health of the animals it helps serve. 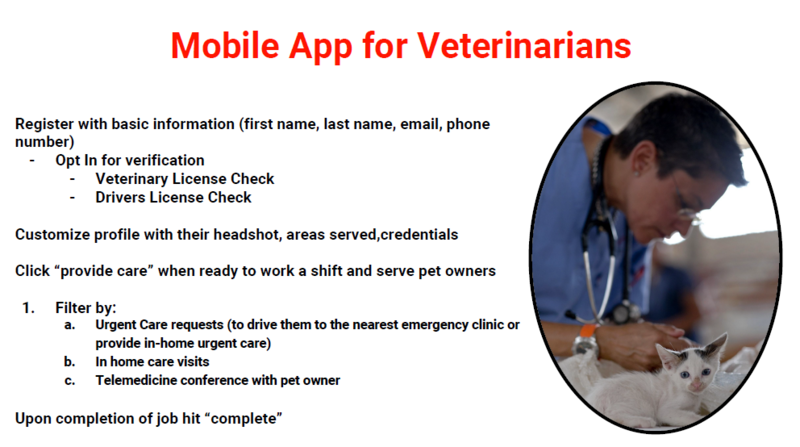 Mobile app that allows pet owners to register and gain access to veterinary care for their animals, either in person, in home or via teleconference.